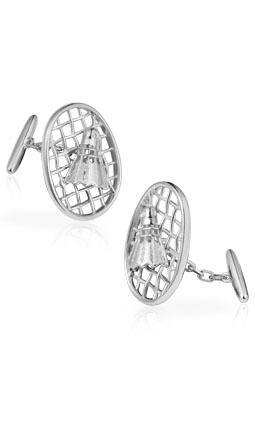 These 925 silver Badminton Racquet & Shuttlecock Cufflinks feature a half shuttlecock resting on the head of a badminton racquet. The badminton racquet head has weaved string detailing. The shuttlecock has a half-crown of ‘feathers’ converging on a shuttlecock ‘cork’. Set in the center of the ‘cork’ is a small diamond.